This mine, situated in what we would today call almost inaccessible country, was not only the first major copper discovery in the Northern Flinders Ranges, but also the first copper mine in that area worked by a company which was wholly owned by South Australians. The copper deposit was discovered by two Cornishmen, Captain James Trestrail and Joseph Curnow, on John Baker's Angepena Station. While waiting for the survey to be carried out by a licensed surveyor, and the lease for the Mochatoona mine to be issued, Joseph Curnow had a closer look at the deposit and some other mineral claims. During this time it was decided to form a company to mine the copper. Very soon the Adelaide newspapers carried a copy of a preliminary prospectus. According to this prospectus, the property had been carefully examined by a much-respected and thoroughly experienced mining agent. One wonders why his name was not mentioned if he was that much respected and had so much experience! The mining agent found the deposit "exceedingly advantageous for mining operations" and nearby a "never-failing supply of good water" and "an abundance of good timber for mining purposes". The same mining agent was also convinced that "several drays could at once be loaded on arrival with copper ore of good quality, calculated to average a yield of thirty percent." Finally he pronounced that the Mochatoona would prove "a permanent and profitable mine". The promoters hoped to raise a working capital of $10,000. This was to come from the issuing of 1,000 shares of $10 each. They also intended to issue a further five hundred shares of the same value as payment to the discoverers. This dubious method would be used over and over again during the next seventy years. Many mines in South Australia were financed in this way. In the case of the Mochatoona mine it meant that the discoverers of the mine became one-third-owners at no cost to themselves. It also meant that only $10,000 became available to start the development of the mine instead of $15,000. The preliminary prospectus stated that the valuable property of the proposed company, within three miles of the Angepena police station, comprised a block of 120 acres, held under a mineral lease granted to the discoverers by the government. 'The main lode is visible at the surface upwards of a mile in length, varying from two to 15 feet wide containing copper ores of several varieties'. Three weeks later, a total of over five hundred shares had been applied for. This number was considered enough by the promoters to open their own office facilities. They were located at 4 Exchange Building, Adelaide, and a general meeting was also advertised for 11 o'clock on the morning of 24 May 1859, to which all share-subscribers were invited. As this date was a Tuesday, very few subscribers found it possible to attend, and it was deemed necessary to adjourn the meeting until 3 p.m. on 22 June. This time it was also decided to have it at a more appropriate place, the Norfolk Arms Hotel in Rundle Street. This date, time, and probably, the place suited most people much better, and it proved to be a successful meeting. With all the immediate problems solved, the company could now go ahead with the planning of opening up their mine at Mochatoona. In a way they were not only pioneers but also path-finders. No one had as yet mined a copper deposit so far north and in such difficult terrain. Their operations would certainly be affected by the high cost of transport, loneliness, isolation and the semi-arid conditions of its location. In fact 1859 was a rather dry year. Only 14.85 inches were recorded in Adelaide. Soon after the historic meeting, the mine's secretary was advertising for "persons desirous of filling the office of Resident Captain and Superintendent", who would be required "to produce testimonials of character and competence". A liberal salary would be given to the successful candidate who applied before 4 July. As the deadline of 4 July passed, either no competent persons had applied or those who had were found wanting in character, because the position was re-advertised on 6 July 1859. Eventually a very competent Captain was found, in the person of John Rowe, "a miner since eight years of age". 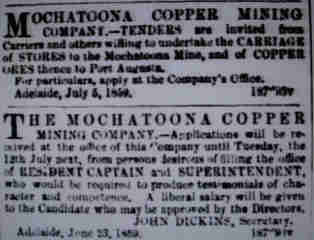 In August 1859 Captain Rowe left Kapunda with a party of 13 ex-Burra miners who hoped "to find more remunerative employment there", even though the Mochatoona mine was more than five hundred kilometres north of the Burra mine. Both the Burra and the Moonta mines complained at times about a labour shortage, caused by miners leaving for the Northern Flinders Ranges. When Captain John Rowe finally arrived at Mochatoona, after a long and arduous trip, he found "a good deal of copper scattered about". Soon he had eleven miners working at the site. The biggest problem was not mining the ore but finding transport for it. This transport, or the lack of it, would prove his biggest worry. Even Joseph Curnow later admitted freely that the roads were so bad in some places, that it would be impossible to make the mine pay. Very little has changed since that time as 125 years later the roads are still as bad as ever in most places. While Captain Rowe was developing the mine and trying to solve some of the immense problems he faced, the directors in Adelaide were trying to finance their mine. By this time Adelaide was also buzzing and speculating on rumours of other fabulous mineral discoveries in the Northern Flinders Ranges. Rumours were so persistent that everyone seemed to be affected by them. Speculation had become the concern not only of ordinary people, miners, the South Australian Mining Company, speculators and mining agents, but also of the government. At last on 12 November 1859 four tons of copper ore arrived at Port Augusta from Mochatoona, with another six tons waiting at the mine for transport. On 28 February 1860 the steamer Maid of Yarra took another three tons of ore. The ore looked exceptionally good, one lump of blue and red copper ore weighing as much as 1,020 pounds. From Port Augusta the ore was sent down to Port Adelaide on the steamer Marion. The large boulder of blue and red ore was later displayed in Grenfell Street. Unfortunately good ore will only pay after it has been smelted and sold. Getting it to a smelter was Captain Rowe's biggest problem. The road to Port Augusta was so bad that two horses could pull only one ton of ore, whereas with the expenditure of a few hundred pounds to improve the road, the same horses could pull double that amount. By the end of the year more than thirty-five tons of copper ore had accumulated at the mine, without any prospects of being removed to Port Augusta within the near future. This would have to wait until at least after the heat of summer. On 28 February 1860 a general shareholders' meeting was held at the Norfolk Arms Hotel. The purpose was to table the reports of Mr White and those of Captain Trestrail, who had taken over from Captain Rowe, who left during mid-1860. During this meeting another board of directors also had to be elected. The newly elected directors had serious doubts about the profitability of their mine, and were not sure about its permanency either. They decided to call in an independent expert to investigate the prospects of the deposit. His report stated that the mine "had looked good at the surface, but had given out at depth". Other mining "experts" later gave similar opinions. For instance, according to Pascoe Carbiss, a practical miner of thirty years, both in England and Australia, the copper had simply run out and "no trial was made to find out where the lode went". Very little was done at the mine after this meeting. Others stated that there appears to have been, by all accounts, some little mismanagement, for although several tons of ore were raised, the ground does not appear to have been judiciously worked, and the funds of the proprietors were exhausted before the mine was fairly tested. So much for a mine which only three years before had been called "permanent and profitable". Most of the shareholders hoped that their investments would be safe and yet become profitable. However with the high cost of transport, aggravated by a severe drought, which was devastating the Northern Flinders Ranges at that time, and the apparent lack of a lode, nobody was prepared to "throw good money after bad". Since that time the mine has been almost forgotten. Occasionally some prospector took out a mineral claim in the area in the hope that he would come across the lost lode. One such gentleman was A. Abrahams who on 7 March 1873 took out four mineral claims for 280 acres near Mochatoona. Very little eventuated from this and it was not until 1890 that the Mochatoona mine was reopened. In August 1905, Thomas Blinman, Thomas Young and Robert Whitbread applied to the Minister of Mines for a subsidy of two hundred Pounds or machinery to develop the mine. They were told that they could have a horizontal boiler ex Callington and a large steam sinking pump from the Survey Department with all the fittings and piping to the value of two hundred Pounds. Repayments would have to be made within two years. Life was and remained hard. 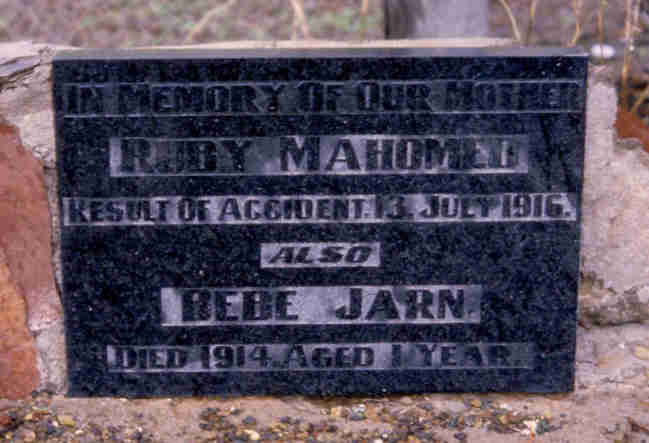 In 1909 Peer Mahomed, who had worked as a cameleer during the 1890s, was interested in trying out the field once more. He had noticed that Christopher Hackendorf, the holder of claim number 8128 of the Lubra mine, had not been on the site for the last five months and applied for his lease.